Will your professional service business profits meet the new ATO guidelines? 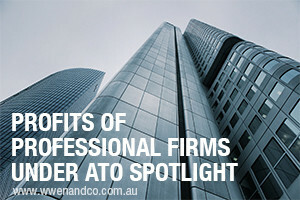 Profits of professional firms under ATO spotlight! The ATO has updated its guidelines on the taxing of profits made by certain professional firms. Specifically, it is focusing on the risk of arrangements that appear to comply with tax law but are purposefully designed to affect a certain tax position (under a tax avoidance rule known as “Part IVA”). Certain professional firms can achieve a particular tax outcome through how they are structured. The ATO’s concern arises from the risk of Part IVA applying to the allocation of profits from a professional firm conducted through a partnership, trust or company where the income of the business is not “personal services” income. The professional businesses within its sights include, but are not limited to, firms operating in the accounting, architectural, engineering, financial services, legal and medical professions. The ATO revealed that its updated guidelines take into account feedback it has received through consultation about the practical issues at work. Benchmarks have been established by the ATO to use when examining income earned by individual professional practitioners (IPPs) to help it identify situations that it says may require Part IVA risk assessment. Equivalent remuneration — the IPP should be remunerated an equivalent amount to the upper quartile of the highest band of professional employees providing similar services to the firm, like employees of comparable firms or relevant industry benchmarks. 50% entitlement — half or more than half of the income from the firm to which the IPP is entitled (directly or indirectly through interposed entities) should be assessable. 30% effective tax rate — the income from the firm to which the IPP (and associated entities) is entitled must be taxed at 30% or more. This last benchmark will also take into account the taxable value of fringe benefits. The ATO also says it will use gross income when considering the benchmarks, although for assessment purposes deductions, losses and offsets will naturally continue to be able to be used. It says that a professional firm that does not satisfy one of the benchmarks will be considered high risk, especially where the effective tax rate arrived at due to business arrangements is low. This article is provided as useful information by W Wen & Co. Chartered Accountants & Tax Consultants.